PC World has a nice slideshow titled, "A Palm Technology Timeline." This article reminds us of the late 1990's when "Palm was King." 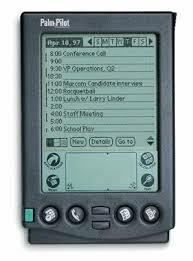 Remember the Palm Pilot 1000 that came out in 1996? It used AAA batteries and the first model didn't even have a backlight. Can you believe that people spent $300 for a little device that had a 16MHz processor and 128KB of memory? Then, Palm became quite progressive with thinner models, color screens, SD card slot for memory expansion, wireless capabilities, and more. The Palm V and the Palm Vx were some of the most popular models because they were so thin. Now, Palm has been acquired by HP, so what's going to happen? To see the slideshow on PC World, click here. I used a Palm III in late 90s and early 2000s. Too much work to keep it synched. Never have done synching with any subsequent devices. Syncing has always been problematic with devices that relied on a wired cable for syncing. Now that so many devices are capable of wireless syncing, we've reached an entirely new level of syncing.